It wasn’t long after Ford introduced the Model A with bumpers as safety measures that people started wanting to decorate their car’s bumpers. Only sticker technology wasn’t really a thing yet, so the first “bumper stickers” were attached to cars with wires or strings, according to Allstate. Later on, wire gave way to the more practical pressure sensitive adhesive, and at that point bumper stickers started proliferating. First used primarily to advertise to others where your car had been (“See Rock City”), bumper stickers eventually branched off in all directions, until they encompassed just about every interest, slogan, political campaign, religious affiliation, or funny saying imaginable. 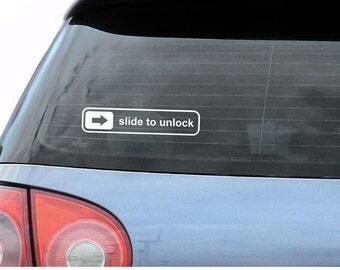 Naturally, there are plenty of tech-related bumper stickers out there, and here are 10 of the funniest of them. 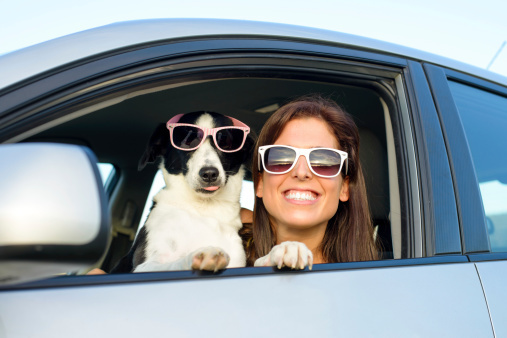 With the possible exception of a cool canine sidekick, a great bumper sticker is the best car accessory. Courtesy of Cathode Tan, we find the bumper sticker version of the disappointing culmination of so many internet rabbit holes. In 2007, Apple’s Steve Jobs demonstrated the “Slide to Unlock” feature to oohs and ahs due to its intuitive and elegant design. Later on, it became the subject of legal wrangling between Apple and Samusung, and somehow became a tech-related pop culture signal on the bodies of vehicles everywhere. 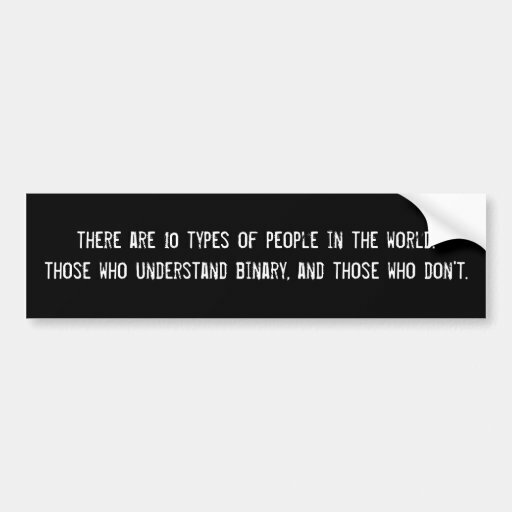 The full bumper sticker reads, “There Are 10 Types of People in the World, Those Who Understand Binary, and Those Who Don’t.” Use a different radix and everything changes. You could, for example, tell everyone you’re 30 when they ask your age. You don’t have to tell them you’re using hexadecimal. 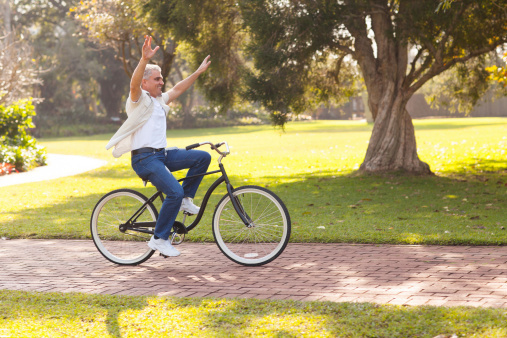 Having learned the “turn it off and on again” technique, Carlos was able to use all that extra free time to perfecting hands-free bike riding. You don’t have to be a fan of “The IT Crowd” to understand this statement, because you’ve probably said it countless times yourself. You’ve probably done it countless times yourself. Kyle on “South Park” fixed the entire internet this way and saved humanity. This isn’t so much a bumper sticker as a way of life. The Bureau of Labor Statistics hasn’t got around to figuring out how much time the average employee spends waiting for websites to load, but it sure seems like it’s a lot. Unfortunately, actual people are expected to be fully loaded as soon as you encounter them, and that’s not always fair. It seems only right that people should wait until you’re fully caffeinated before asking you to do things. 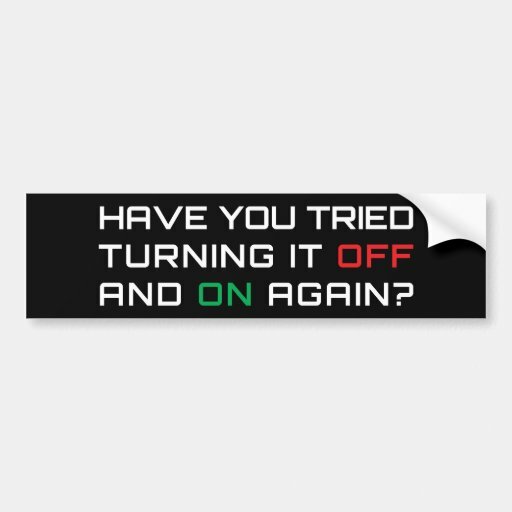 How many tech problems could be prevented if only people planned ahead? Plenty, that’s how many. From declaring BYOD with no exit strategy to deciding that big data will save the world, going full-steam on tech initiatives without planning is one of the main reasons the unemployment rate for IT people is so low. That Beatles song is stuck in your head now, isn’t it? Admit it: you remove stuff from your USB ports without “safely ejecting” all the time, and you get away with it. Hey, you didn’t choose thug life; thug life chose you. Here’s a tech saying that can apply to just about every area of life. Two of your tires touching the lines on your parking space? Parking 1.0; you’ll do better when you come back from lunch. Spill coffee on the report you were supposed to hand to the boss this morning? Report 1.0, which you’ll re-print. Everyone locked out of the user portal you thought you’d finished yesterday afternoon? User Portal 2.0 will definitely have the feature of being accessible. Remember: if at first you don’t succeed, redefine success.